EA Partners was able to foresee the critical and retail demise of APB, which may have destroyed developer Realtime Worlds. 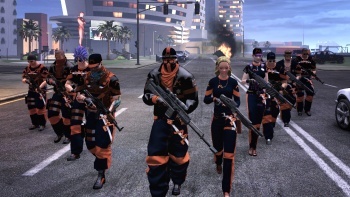 Realtime Worlds' APB was unfortunately received poorly by critics and consumers, sending the studio into administration and forcing layoffs. In a seemingly rare case of honesty, EA Partners, which signed a deal to provide distribution support for APB, says it knew the game was going to be criticized for its issues. EA Partners head David DeMartini told GI.biz that it tried to warn Realtime Worlds of a possible poor reception. "We did suggest that where it landed from a review score standpoint was where we thought it was going to land from a review score standpoint," he said. He reveals that EA was "advising" Realtime Worlds about where it thought APB was near the time of release, and possibilities about the decisions they could make for the title's future. He continued: "I imagine they think they could have done some things differently at this point, but hindsight's always 20-20." DeMartini overall seems to feel terrible about the whole situation, and wonders if there even was a good decision that Realtime Worlds could have made or a way that EA could have helped. "Everybody thinks that they should have just hung onto it a longer time, but 300-400 people cost a lot on a monthly," he said. "I don't know the specifics of their situation but you need to have financial backing in order to have your enterprise up and running, so it certainly wasn't our decision." According to DeMartini, APB has elements such as the "customization/character creation" that are "worth the money," but says it's unfortunate that an idea with such "tremendous promise" wasn't able to deliver as its creators hoped. It seems like APB ended up on a downward slope at one point that was so steep, nobody involved with the game was able to save it.